"This has become a St. Patrick's Day tradition in our house. The kids love it, and so do I." Drizzle chocolate syrup around inside walls of 2 tall glasses; pour shake into glass. Top with whipped cream and green decorator sugar. Frozen decadence with vanilla ice cream and mint extract. I make my own homemade vanilla ice cream add milk to consistanty to a thicker shake. 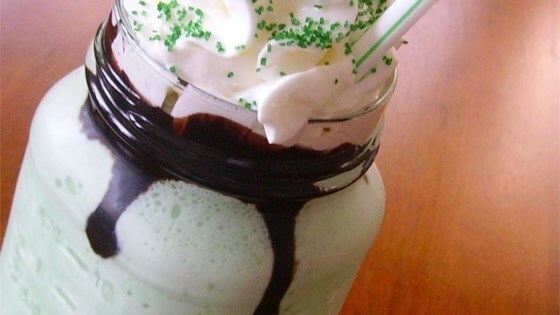 Two teaspoons of mint extract 8 drops of green food coloring and top with whip cream. This was fantastic! I made it exactly like the recipe with Haagen-Daz vanilla and it was a big hit with the whole family! We will be making these at home from now on!! These are so good! I used less milk, start with 1 cup and add more as needed. But I like these thick. Who needs to go to McDonald's now? I just made a ton of this stuff. Everyone loved it. I would use less milk though. Maybe start off with one cup (which was perfect for us), and add more if you need to.